This is not a diet recipe by any stretch of the imagination but it is so delicious. I really wish I had more to say about it than try it. 1 recipe of your favorite pizza dough. I used Jay’s Signature Pizza Crust from All Recipes which is enough for two pizzas unless you have a huge pan so I just used half for this and made a pepperoni from the other. 1 cup of diced cooked chicken I just used canned because it was easiest on me. 1/4 cup or so shredded cheese. I didn’t want to use Cheddar so I used two pieces of deli sliced Provolone. Preheat oven to 400 degrees. Place pizza dough in a lightly greased pan. I used a cast iron skillet because I only have one cookie sheet that will fit in the roaster oven. If the crust is going to be thick I would par-bake it for about 8 minutes . Heat the olive oil in a skillet over medium heat then add the spinach, salt, pepper and garlic powder. When the spinach is hot add the chicken and cook a minute or two longer to heat the chicken. 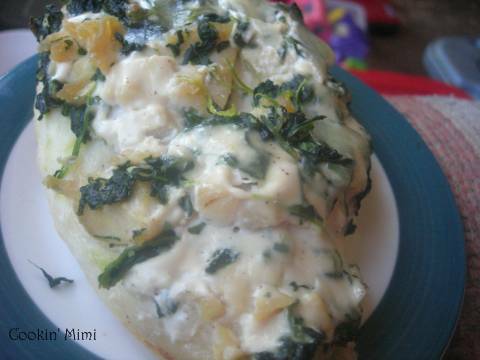 Pour one cup of Alfredo sauce on the crust and spread out, top with the spinach and chicken mixture. Add a little more Alfredo sauce if desired and top with cheese. Bake until topping is bubbly and crust is cooked all the way through and starting to brown. Yum! I’ve made something similar and it’s a hit. How can you go wrong with alfredo sauce? Mmm! I love Alfredo sauce especially with chicken.